Having been at the University of Kansas (Kansas Jayhawks) as a student and now working at Gonzaga University (Gonzaga Bulldogs), discussions about college basketball are inescapable. 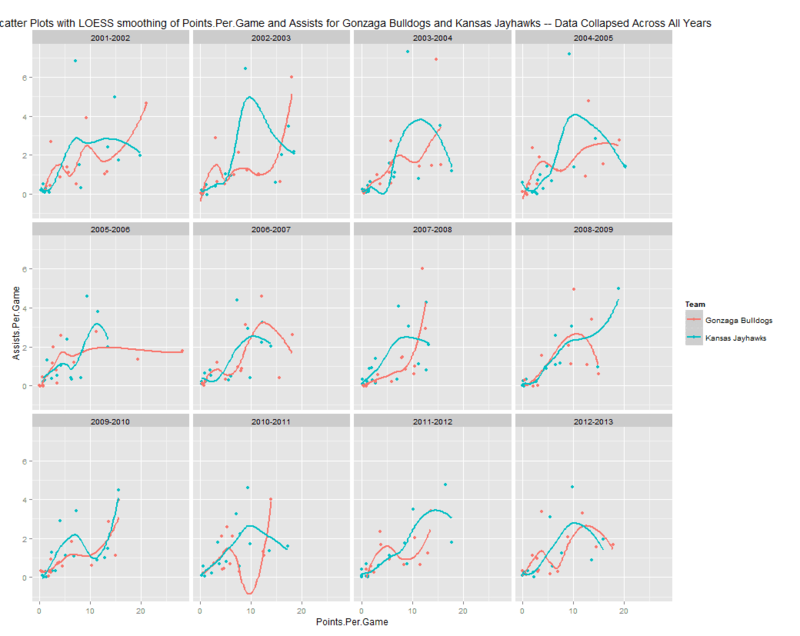 This post uses R, ggmap, ggplot2 and the shiny server to graphically visualize relationships between few basketball related variables for two NCAA basketball conferences – Big 12 and the West Coast conference. Code used to generate graphs in this post and for the shiny server application referred to in the post can be found here. A visit to espn.com’s page at http://espn.go.com/mens-college-basketball/teams shows a listing of universities in different conferences. The image below presents one such example. 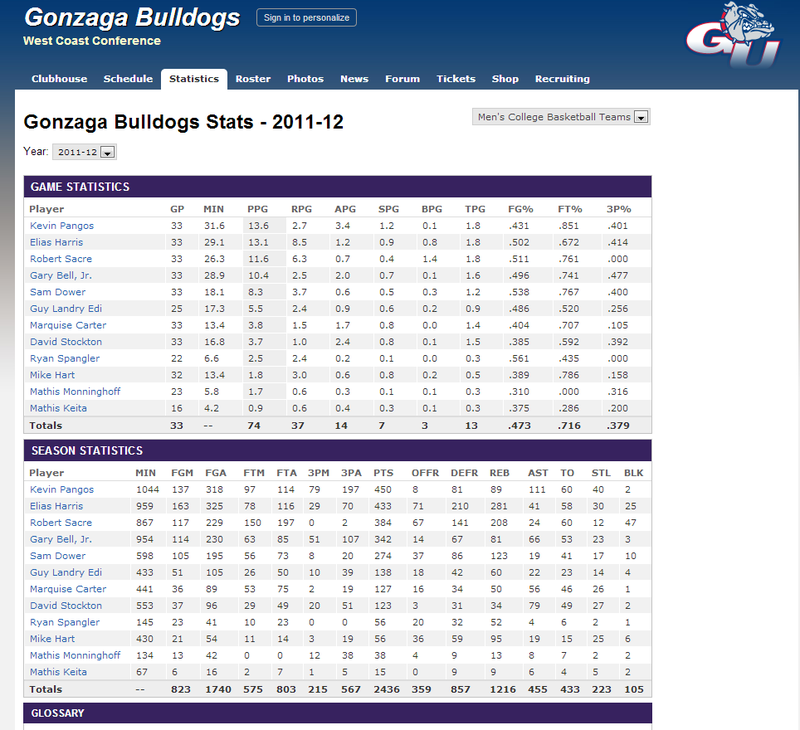 A click on the “Stats” link for a school will take you to a page like this. The page provides two tables – one of game statistics – total games played and the per game statistics for the season for all players from that team and the second, cumulative numbers for the entire season. Tables in this format are useful, but they do not provide information on relationships between variables, between teams, or between conferences. So, the objective of this post is to visualize few of these relationships. In order to do this, we do the following. 1. We focus only on the first of the two tables of statistics provided by espn.com (see the previous image) — total games played and per game statistics. Please note that these are player level data. 2. 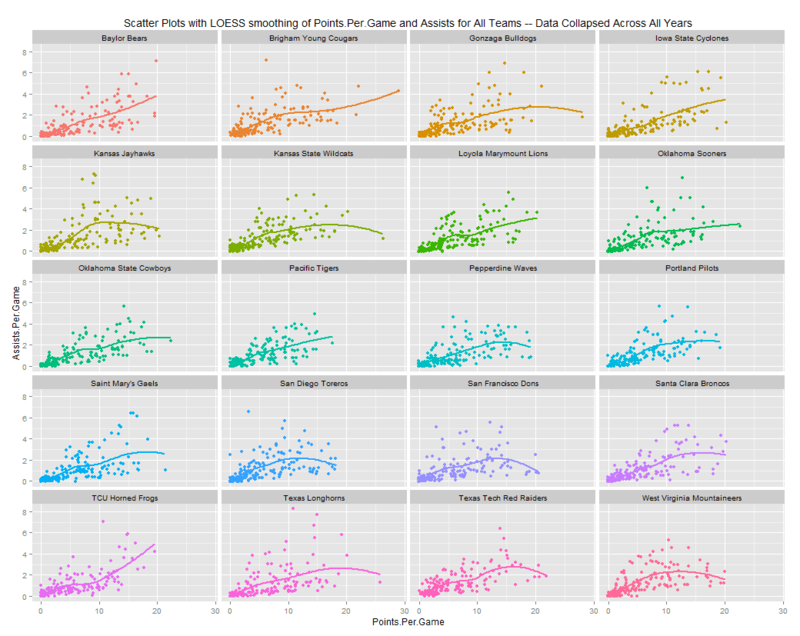 This post does not look at individual players, by name, in different teams — so it does not identify best players on any variable — but it uses player level data to study teams and conferences. 3. We look at only 20 teams, 10 each in the West Coast Conference and Big 12 —- but with some extra time, interest, and patience (TIP), it can be used for the remaining 331 Division 1 teams in 30 different basketball conferences. (b) The second part, year, represents a season — so when Part 2 is 2012, the page described the 2011-12 season. This is something to remember to make the necessary change in the data. 3. The basic idea is to create a function, which does the following. 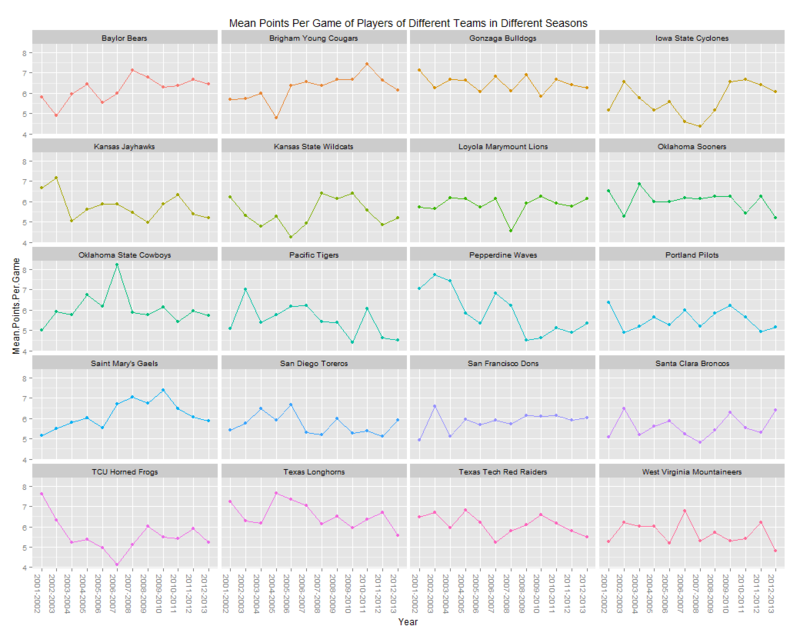 (i) Take in Part 1 and Part 3, among any other variables we deem appropriate as inputs;(ii) loop through pages representing different seasons for a team; (iii) from each page extract two tables and update two master data frames with data from these two tables — two because we have game stats and season stats (the latter is not used for analysis in this post — but the data is available for anyone wishing to look at them). This function should then be used to extract data for 20 universities. Initialize two empty master data frames, which we’ll call Gamestatistics and Seasonstatistics, and provide column names from the two tables. Note that we have created columns for Year, Team, City, and Conference. — variables beyond the columns provided by the two tables and will either have to be calculated or manually determined. 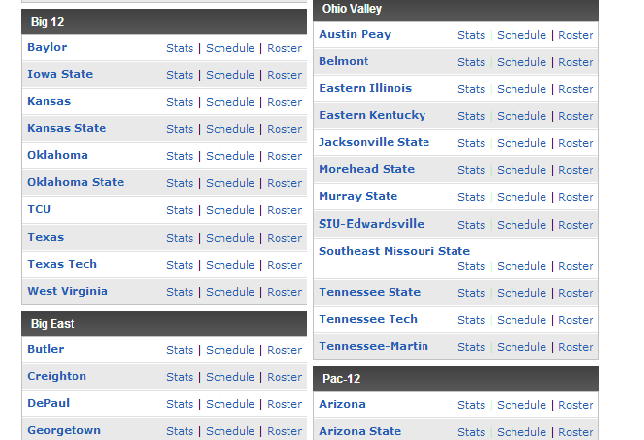 For each of the 20 colleges of interest from the 2 conferences, we can prepare something like the following. The city information was obtained from Wikipedia for those I didn’t know and the other information was available on the espn page for that university. Once we have prepared the parameters required to send to our function (getData), we then call on it. Remember that the function should return two tables. This we collect in a list named gameandseasonstats and extract the updated master tables – Gamestatistics and Seasonstatistics tables from the list. (b) For every year’s page, from 2002-2013, it assembles the complete URL of the page by adding URLpart1, the year, and URLpart3 together. (e) Add these rows to the respective master tables – Gamestatistics and Seasonstatistics and return them in a list, which we retrieve outside the function and reuse them for the next school. The dataframes have three types of rows which need to be removed. These are instances where the value of “Players” is either “Players”, “Total”, or “NA” (remember, we initialized empty dataframes). This is from the way tables were read by our function. That’s easy. Then, columns were renamed to explain each variable completely, so PPG became Points.Per.Game. This could’ve done this at the very beginning, but I didn’t have the foresight. And the last thing left was converting years back to seasons — so 2002 became “2001-2002”, accomplished using this for years between 2002 and 2013. Remember, these changes are required for the second table as well — Seasonstatistics, which we don’t use for the post. However, both these cleaned dataframes are available for anyone to play with. They are with the code at the github link provided previously. Let’s plot these cities on a map. 1. BYU is in Utah, which isn’t a coastal state, unlike the other schools from the WCC. 2. WVU doesn’t exactly fit the region of the other Big 12 schools. 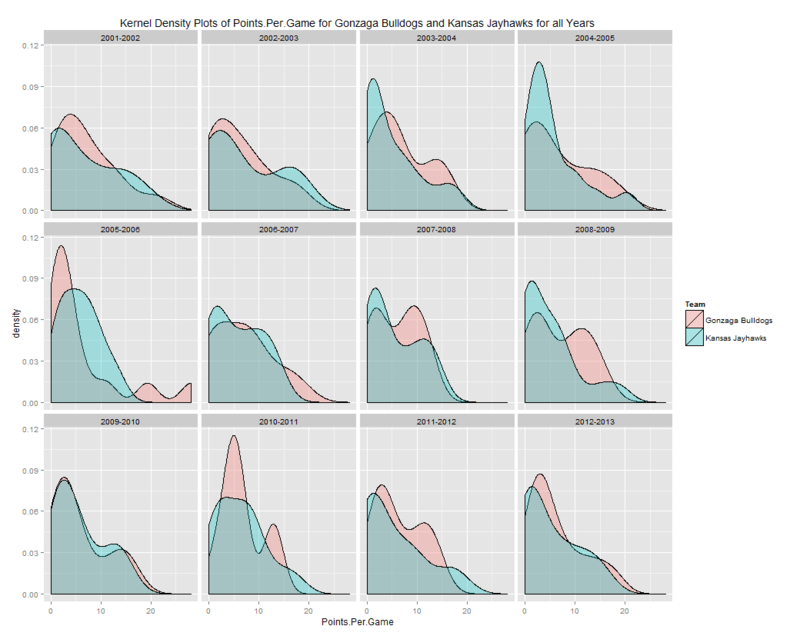 Let’s plot histograms of some variable, say Points.Per.Game, for all teams. 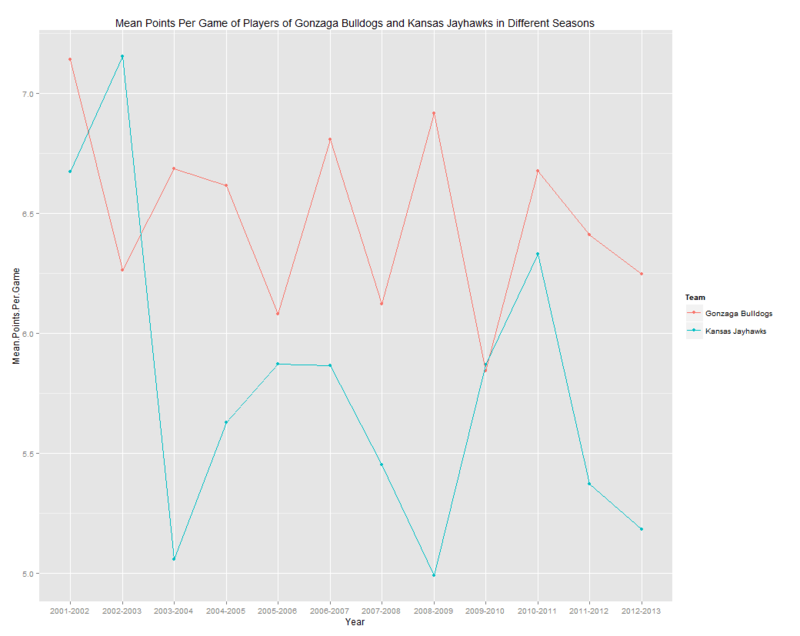 We could also compare the distributions of two different schools on one variable — let’s take a look at Gonzaga Bulldogs and Kansas Jayhawks on say, Points.Per.Game. 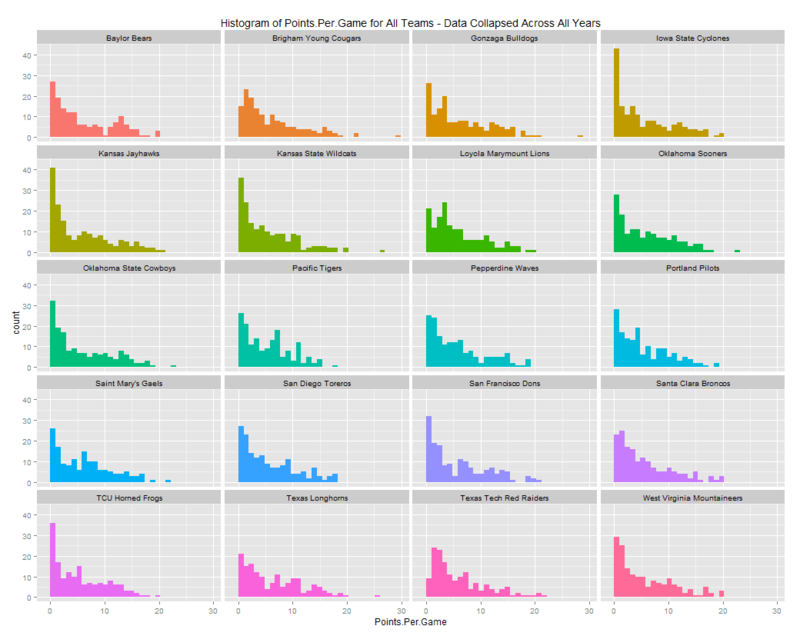 We could also compare the relationship of two variables – points per game and assists per game, for two or more schools. Of course, previously shown graphs could be generated for comparing both conferences and we could also have other variables of interest that we might want to compare different schools or conferences on. It would be unwieldy to present graphs of all possibilities here. Introducing interactivity by letting you play around with variables and schools will help. For this, we rely on the shiny server platform from RStudio. Our shiny server application uses three preloaded data files – Gamestatisticscleaned.rda, and files for team-wise and conference-wise means (labeled meansteams.rda and meansconferences.rda, respectively) of all variables for all years and presents 9 different graphs. The code to generate these additional data files is given below. 1. 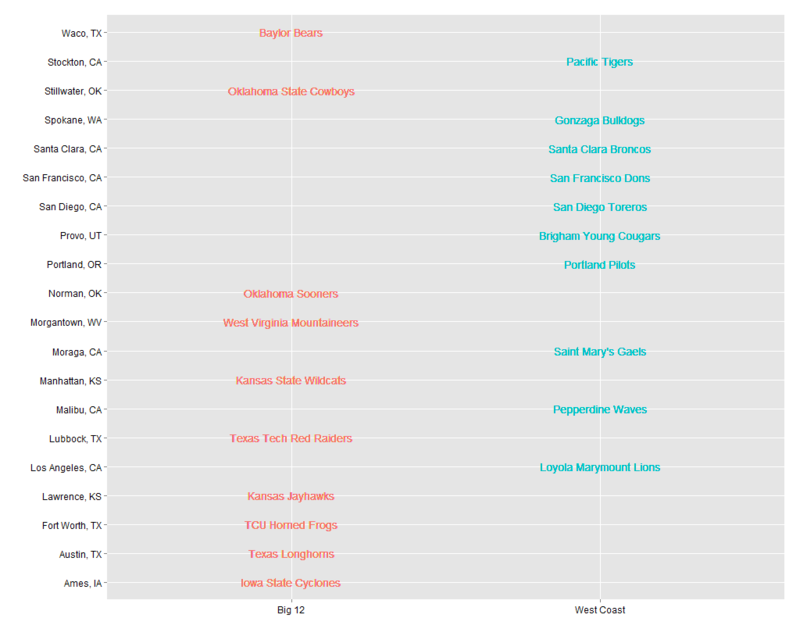 The objective of this post was to visualize few relationships between game statistics presented for teams by espn.com for two NCAA basketball conferences – West Coast and Big 12. 4. Only one of two tables — one concerning game statistics – was used for the analyses and the data from the second table, season statistics —cumulative numbers for the entire season — is available for download from the previously provided link. To leave a comment for the author, please follow the link and comment on their blog: Adventures in Analytics and Visualization.